It was fun to see two of our upcoming celebrities appear on the 47th annual Academy of Country Music Awards Show on Sunday, April 1. On the show, actor, comedian, banjo player Steve Martin paid tribute to the late banjo pioneer Earl Scruggs, and singer Scotty McCreery, reigning American Idol winner, was crowned ACM New Artist of the Year. Both performers will take the AMT stage in the next couple of months; it will be the first appearance here for both. 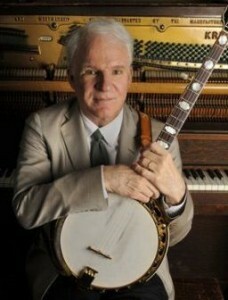 On Friday, May 25, we’re excited that Steve Martin arrives to perform with the Steep Canyon Rangers. During the ACM Awards show, Steve demonstrated his banjo expertise, hitting the stage with Rascal Flatts to honor Bluegrass and banjo legend Scruggs who passed away in March. It was only fitting that they selected the band’s current hit “Banjo” to honor such an influential country musician. We’re also thrilled to have Scotty McCreery take our stage on Thursday, July 12. 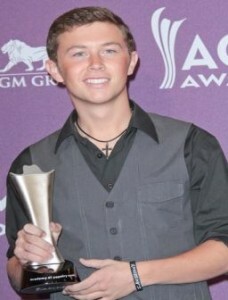 Scotty is the 2011 American Idol champ, and last Sunday evening was voted ACM New Artist of the Year by his fans. On his nomination, Scotty told The Tennesseean that “It’s a huge deal.” Scotty recently hit one million sales of his debut album, Clear as Day, and received his platinum record on American Idol on March 29. Here at AMT, we’re proud to bring former, current and future ACM award winners and nominees to our stage, keeping our connection with the Academy of Country Music as strong as ever. Tickets still available for Steve Martin (left photo) – click here. Tickets on sale to the public for Scotty McCreery (right photo) on Saturday, April 14.